There are over 200 species of Philodendron. They are epiphytic herbs, primarily with climbing stems. 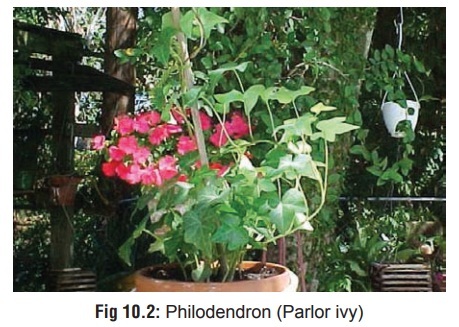 There are over 200 species of Philodendron. They are epiphytic herbs, primarily with climbing stems. They rarely stand erect. Identification is difficult because of the many different sizes and shapes of the leaves. Small plant with variously shaped, glossy, dark green leaves (Fig 10.2). · This plant contains calcium oxalate crystals, and causes GI irritation and local swelling. The raphides are contained in ampoule-like cells that, when ruptured by chewing or crushing, eject their contents into tissue. It appears that the rupturing of these cells, and the injection of the cell contents occurs at the same time. Crystallographic evidence indicatesthat there is some free oxalic acid in the cells. · The raphides may also be coated with various proteolytic enzymes which produce additional tissue damage. 1. Mild GI distress: Dysphagia, nausea, vomiting, oral pain, and perioral swelling may occur. Stomatitis, swelling of the tongue, and excessive salivation may be seen after ingestion. 2. Hypocalcaemia and tetany are unlikely unless large amount has been ingested. 3. Cutaneous exposure results in delayed contact dermatitis in sensitised individuals, due to the presence of resorcinol (an alkyl agent). Allergic contact dermatitis has been reported in a number of cases. Philodendrons may have as much as 0.7% oxalates. As little as 5 grams may be fatal. This would represent over 700 grams of leaves. o Dilution with milk or water may be of benefit by washing out the crystals and assisting in decontamina-tion of the oral pharynx. o Cold water or ice pack application may relieve local pain in the mouth. · Analgesics may be required if the pain is intense. · If large amounts have been ingested, the urine may be examined for oxalate crystals, but so far, crystals have not been reported after philodendron ingestion. · Corticosteroid dressings have been recommended for treat-ment of allergic dermatitis.